Originality – A new twist on Cookie Crisp. I had visions of sugar cookies with sprinkles on them, which is a great thing. Mouth Feel – A little too hard for me even after soaking for a few. Jocelin Cap was ok with the mouthfeel after they soaked for a bit she said. The kids didn’t think they were too hard at all. Sweetness – Jocelin Cap thought that they were a nice level of sweetness, not overpowering. I would agree, but if I had to step to one side or the other, they still are a sweet cereal at the end of the day. For the Kids I do not there is really anything that is too sweet for them right now. Flavor – Surprisingly mild and not overpowering, Jocelin Cap thought it was going to be too sweet before tasting it. She found a hint of cookie flavor. I found the flavor to be vanilla rather than a sugar cookie type with sprinkles. That is not to say it wasn’t an enjoyable flavor, just that when I think of cookies with sprinkles I think of sugar cookies. The kids thought it tasted like cookies, they could not really taste and sprinkles they said. Look – Dusted with color chips not real sprinkles but the look is good and what you see on the box is what you are getting in your bowl. 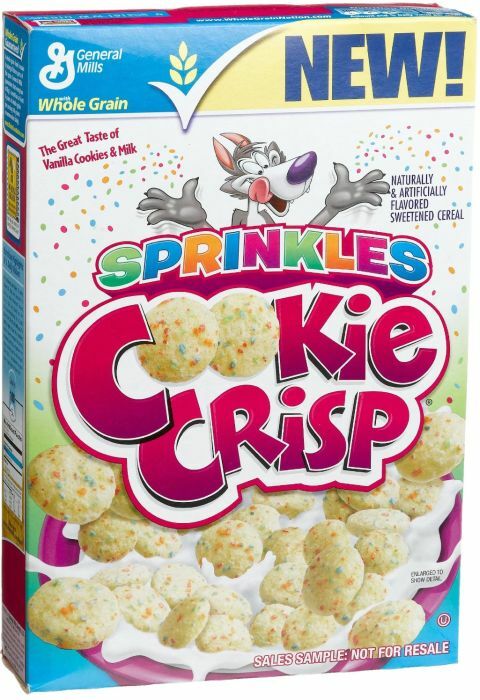 Packaging – Again you know you are eating Cookie Crisp as you get the Chip The Wolf on the box and they also use some nice sprinkle colors to draw you in. We get a maze on the back of the box as well for the kids to play while eating. Can I just say I loved the wizard from earlier days on the box? Around the Table – This was a surprise for me as I usually like the milk after the cereal, but it held no appeal for me. I would have thought the others would have felt the same, but I was way wrong. The rest of the family liked the milk after the cereal was gone. Kid C had two bowls and Kid N switched to a different cereal for bowl two, but was still enjoyed the bowl of Cookie Crisp Sprinkles. Where can i find these different kind of cereal rather than the chocolate ones?